Our Solar Panels Are Now In Service! Installed on November 20th, our solar panels were inspected and began contributing clean energy to our school on December 27th, 2010. To see the live feed, follow the link below. To view the press releases of our project, follow the links below. 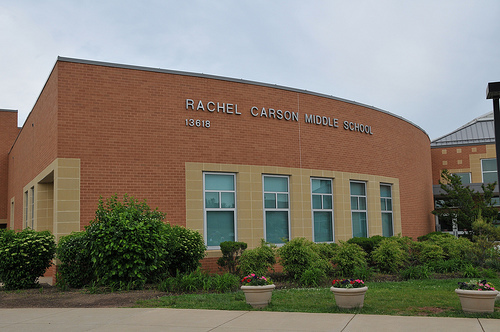 Carson FREE is the group formed by eighth grade students at Rachel Carson Middle School in the 2008-09 school year, and has been continued by the Going Green Club. FREE stands for Future Renewable Energy Effort. Our school raised enough money to purchase an array of eleven photovoltaic solar panels, which are now in working order on our school's roof. We did this to offset the burning of fossils fuels, and also to teach other students how effective this method of energy generation is. This is an effort conducted by the students of the 08-09 school year and the Going Green Club, with the advice and support of our librabrian, Mr. Treakle.